DSP sounds like a 60's surf musical starring David Bowie and Sleater-Kinney, with the B-52s’ Fred Schneider as the crazy uncle. They are a female-led indie rock band based in the lush, leafy town of Eugene, Oregon. Sixties garage rock served up with a heaping portion of psychedelic surf-punk & a side of math-pop make this musical feast your perfect midnight snack. Their exuberant set is a full-course fiesta featuring a calorie-burning cuisine of riot-grrrl romps and playful ballads with sweetly-honed harmonies. Plus they’re always sure to serve you some succulent make-out songs for dessert, like sweet treats on your pillow. Blame full-flavored founding member, singer/songwriter/guitarist Melissa Lubofsky for DSP’s genre-mincing sounds. Her smorgasbord of influences vary wildly - David Bowie, Jimi Hendrix, and the Pixies, to name a few - but her eclectic style could be partly explained by early experiences as a reluctant math nerd. This may also have contributed to her tendency to complicate an innocent song until it's bordering on pop-punk prog. A neurotic idealist, she wishes she could find the recipe for saving each endangered species and turning everything green and sustainable. Failing that, her mission is to discover the ingredients for keeping a sense of humor and inspiring people to save the world in fun and delicious ways! The band’s other founding member is delectable drummer Kim Lindquist. Rumored to be the love child of Karen Carpenter and John Bonham, her punk background adds spice to Melissa’s sugary melodic tendencies. Indeed, this seasoned musician has been playing drums since the tender age of twelve. She is also a gourmet graphic designer, cooking up DSP art for CD covers, t-shirts, and more! Their trio is completed by bassist Annette Scarle folding some "meatee" chunks of rhythm into the DSP sauce. Check out their set which includes tunes from their latest EP "Heart In Outer Space": an adventurous romp that includes a B-movie broken-heart voyage into outer space, a chocoholic's semi-delusional plan to save the world, and an ode to a girl that really gets your energy up - or is she just an espresso-fueled hallucination? DSP's sound is full of quirky fun that will bring a smile to your lips and a shake to your hips! Demimonde Slumber Party (DSP) was formed in San Francisco in the 1990’s with the musical union of singer/songwriter/guitarist Melissa Lubofsky and drummer Kim Lindquist. They played with several bassists around the SF Bay Area before things really clicked with Tim Romain. After enjoying a short happy time together, Tim moved to Seattle, and Kim and Melissa moved to Eugene, Oregon. 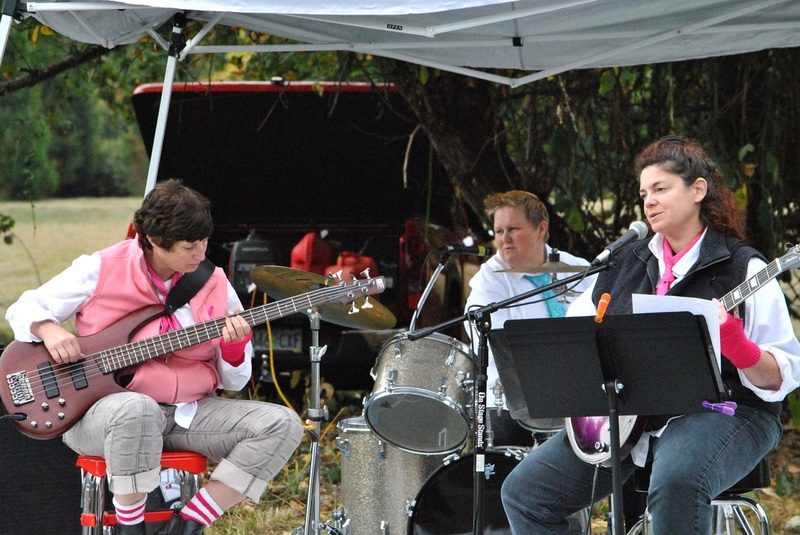 For several years the band went into semi-hibernation, performing only for special occasions, such as a house party to benefit a local Humane Society. During this time Melissa and Kim pursued other creative activities including animation, stand-up comedy, and musical theater.